La SociÃ©tÃ© is probably offering some of the best shows in the city. 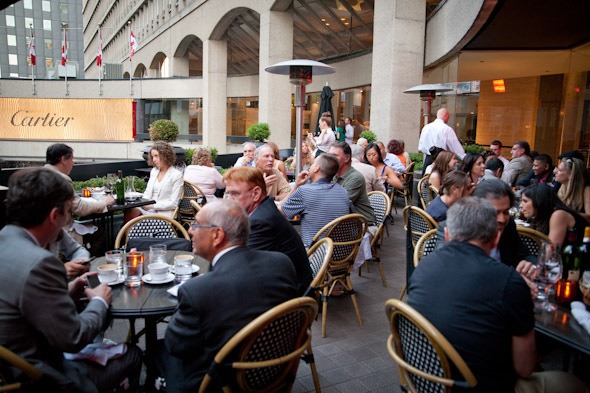 Its two patios — decor-wise — are somewhat understated and refined, allowing the real glitz of performance to emerge among the pedestrians along Bloor. The street level patio gives patrons the opportunity to feel in amid the crowd, while the upper patio lets dinner diners experience the pleasure of literal and figurative "looking down." Ah, this is starting to feel like Paris! 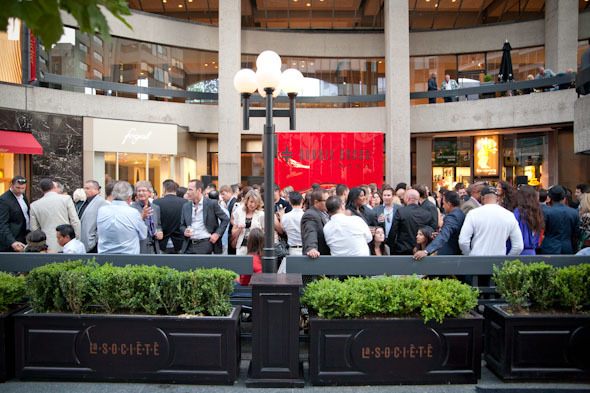 Here are some of the details on La SociÃ©tÃ©'s two patios. Take note — these two patios are entirely different spaces. The street-level patio is for a quick bite for colleagues after work, cocktails with the girlfriends, or a spot to express vocal displeasure with the latest World Cup outcome. Just make sure you get it all out before heading upstairs. The upper level patio is strictly for full dinners, and lifting your shirt to reveal your painted-on Italian flag may not go over too well (though feel free to try to prove me wrong). Both spots, however, are primed for perfect people-watching with just the odd green adornment to soften the view. Really, can you get much better than a spot right on Bloor? Again, this depends on where you're sitting. The upper patio is for those who are looking to test the integrity of their belts with a little linguini pasta, braised short ribs, or a good old 12 oz aged New York strip. The lower level patio is more for casual noshing and sharing. The reduced menu includes lighter fare such as fois gras, oysters, and a few other cold and/or raw options, as well as a $28 tasting platter. When in doubt (and famished), move up. 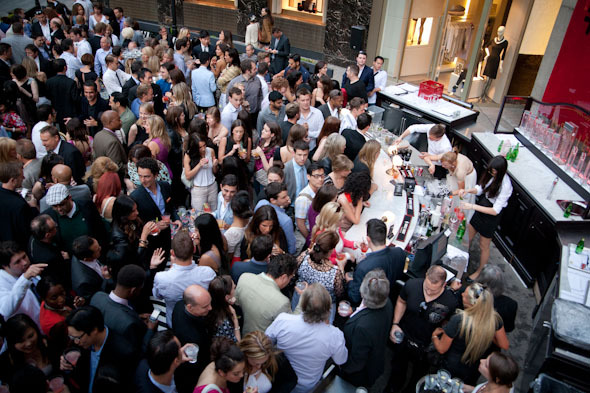 Yes, that is indeed an outdoor bar and street level barbecue — its power of seduction has been well-noted. The other big attraction is less evident visually than at bill-paying time; the restaurant runs daily specials that include $1 oysters on Thursdays and 1/4lb lobsters for $24.94 on Sundays. And then there's weekend brunch, because nothing beats croque-monsieur with a little natural sunlight. (Well, maybe a mimosa thrown in there too?) The patios are mostly uncovered and heat lamps can be rolled out when the temperature dips. Onto that burning "R" question — reservations. La SociÃ©tÃ© likes to use the term "requests," as in, it will take a request for a table on the upper patio, but it will not go so far as to guarantee its hold. The lower patio, on the other hand, is strictly first come first served.